The UEFA Nations League is an international football competition contested by men's senior national teams in the Union of European Football Associations (UEFA). The concept for the competition was to provide more meaningful games than traditional international friendly matches which were largely uncompetitive. The idea for another national European football tournament was raised in 2013 by Norwegian Football Association President Yngve Hallén. UEFA general secretary Gianni Infantino stated in March 2014 that one benefit of the tournament would be to assist less glamorous nations in arranging games. The Football Association's chairman Greg Dyke acknowledged that the competition would be attractive to England who could test themselves against other top-ranking national teams on a more regular basis. The concerns for lower-ranked nations benefitting financially from the competition is supposed to be offset by a centralised television contract with UEFA. The UEFA Nations League was unanimously adopted by the 54 UEFA member associations in Astana on 27 March 2014, with Kosovo joining UEFA in 2016. When did the UEFA Nations League start? The first competition began in September 2018 following the FIFA World Cup with the winner to be decided in June 2019. A total of €76.25m in solidarity and bonus fees was allocated for the 55 competing nations. The matches are scheduled to take place on the current International match calendar to avoid affecting the FIFA World Cup or UEFA European Championship. Each season will see the pool stage played from September to November in an even-numbered year. In June the following odd-numbered year the UEFA Nations League Finals will occur with a champion crowned every two years. What is the UEFA Nations League Finals? The UEFA Nations League Finals is a knockout tournament involving the four League A group winners. One of the four nations will be chosen host the Finals. The semi-final winners advance to the final with the defeated nations contesting a third-place play-off. The winners of the UEFA Nations League Final win a sterling silver trophy and €7.5m in prize money. All 55 UEFA members associations' national teams were divided into four groups based their position in the UEFA National Team Coefficient Rankings. The format will begin with 12 teams in League A, 12 teams in League B, 15 teams in League C and 16 teams in League D. In each division there will be four groups of three or four teams who will play each other home and away. In League A, each winner of the four groups will contest the Nations League Finals. The Nations League Finals will feature two semi-finals and one final to the UEFA Nations League champion. 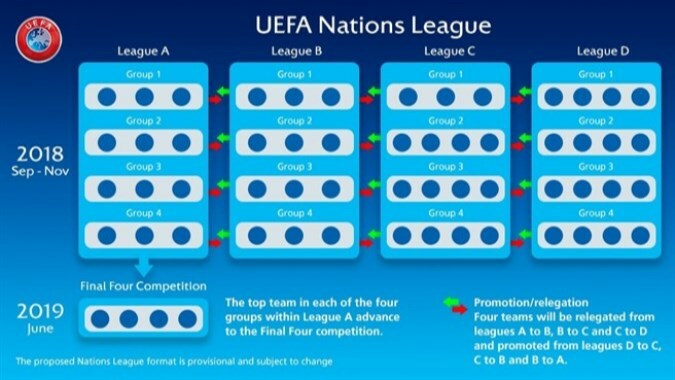 How does promotion and relegation work in the UEFA Nations League? Promotion and relegation depends on results within each group. The four group winners in Leagues B, C and D are automatically promoted to the next higher division. Nations that finish bottom of the groups in Leagues A and B are relegated, while the three fourth-placed teams and the lowest-ranking third-placed team in League C are relegated to League D.
How can teams in the UEFA Nations League qualify for the UEFA European Championship? The UEFA Nations League will have an added function which will provide teams with another chance to qualify for the UEFA European Championship. Four nations that are not one of 20 qualified teams will compete for the four remaining qualifying spots for the European Championship. The play-off round will involve the 16 UEFA Nations League group winners, unless they have already qualified in which case the spot will be taken by the next best ranked team in their league. Each League in the UEFA Nations League has its own path, consisting of two single-leg semi-finals and a one-off final. The winner of each path wins a spot in the UEFA European Championship. 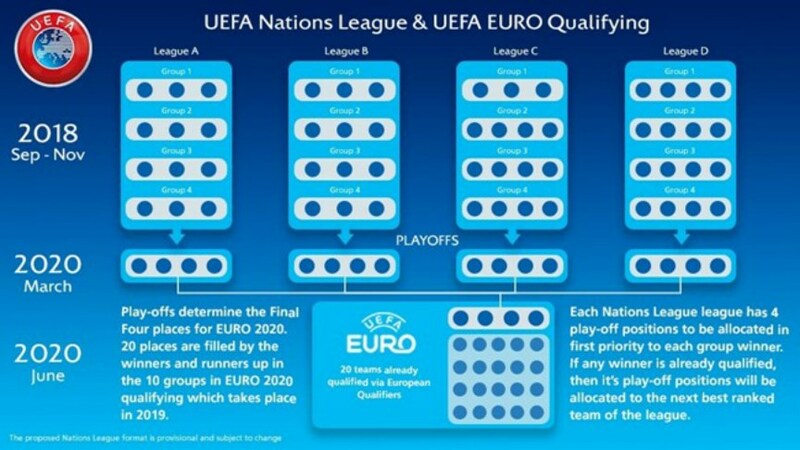 The UEFA Nations League will also be linked to UEFA's World Cup qualifications with a format yet to be decided. At FreeTips.com we will have regular UEFA Nations League football tips including over/under 2.5 goals tips, first goalscorer tips, UEFA Nations League accumulator tips and futures and outright tips such as group winners. We are dedicated to providing you with expertly researched UEFA Nations League football tips that you can use to have a successful tournament and build your bankroll.